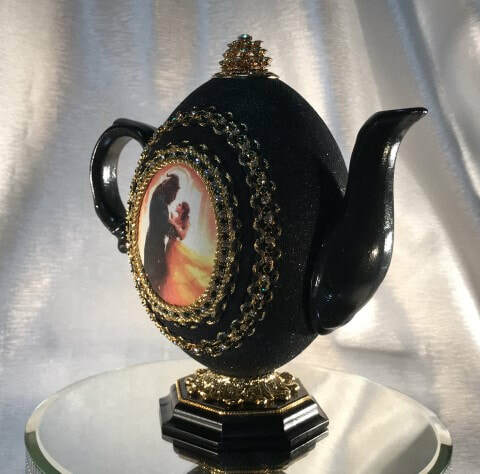 A goose egg designed into a hanging teapot with pouring tea into a decorated duck egg cup. 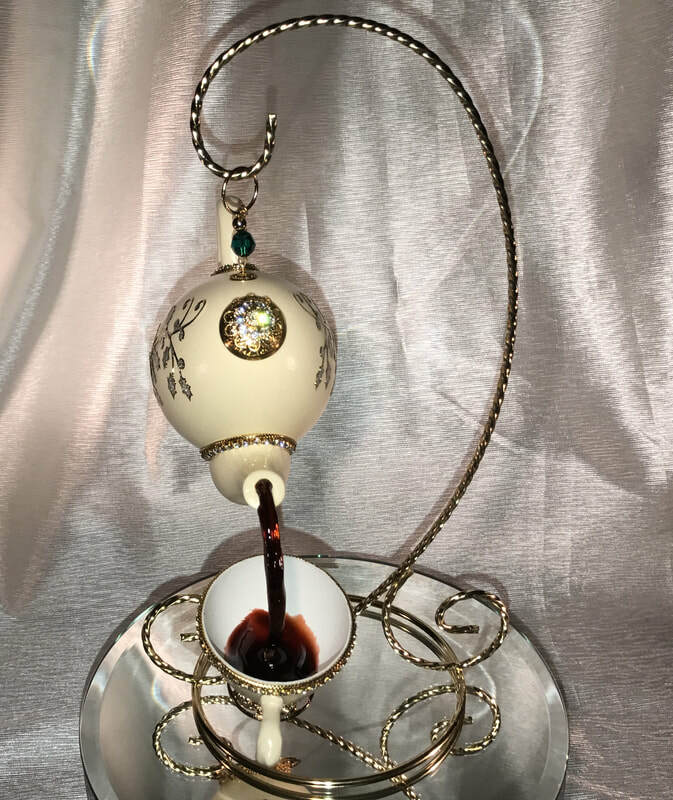 Decorated with Austrian gems, decorative filigree and crystals around the teapot and finished with an crystal filigree as a topper. 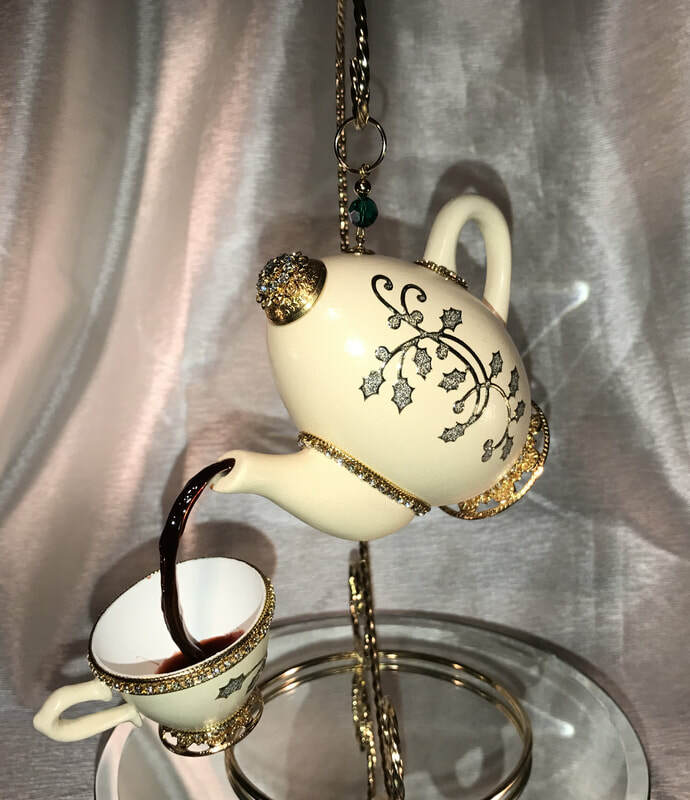 The tea is magically giving the illusion of pouring from the pot into the floating teacup. 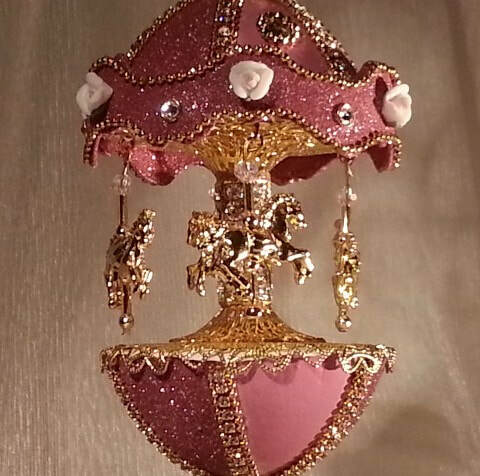 A large goose egg is transformed into a glittering carousel. 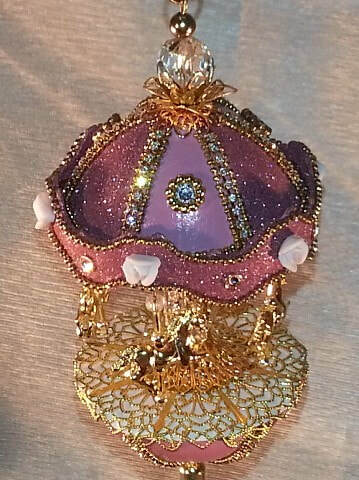 This design is decorated with Austrian crystals and gold filigree. 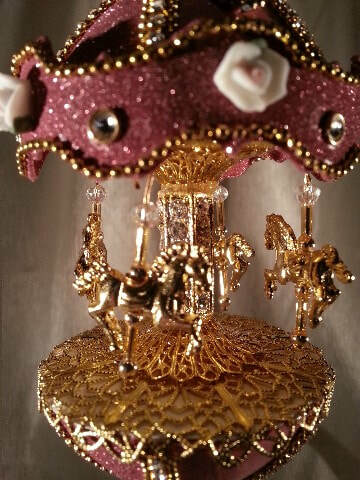 The carousel is accented with flowers and four gold plated horses. 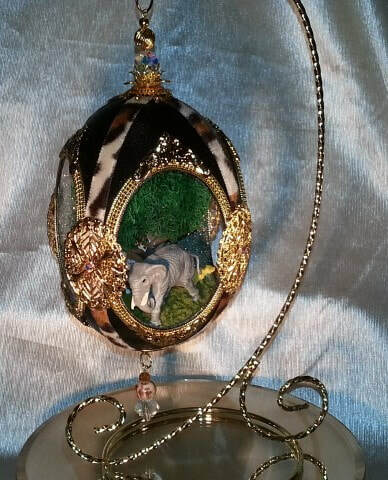 This ornament design can be hung on a Christmas tree and then moved to a stand for enjoying all year long. 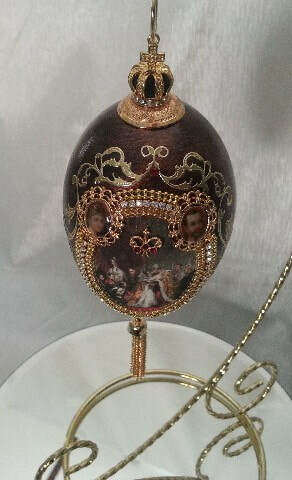 A rich and elegant Goose egg is designed as a tribute to the pageantry and intrigue of Nicholas II and Alexandra, the last Czar of the Russian Empire. 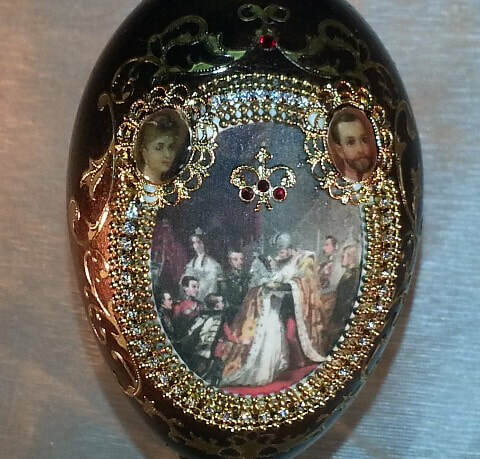 The silk print captures the magnificent coronation of the Czar of Russia. 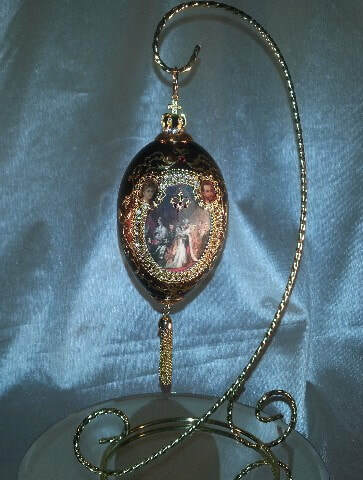 A Jet black and crystal Austrian chain and gold filigree is used on this design. 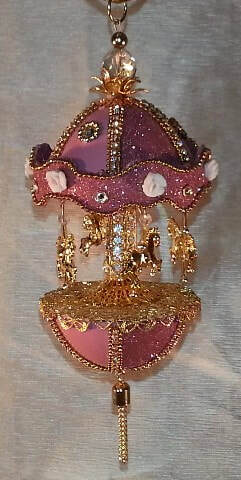 The egg ornament is completed with a unique crown finial for hanging. 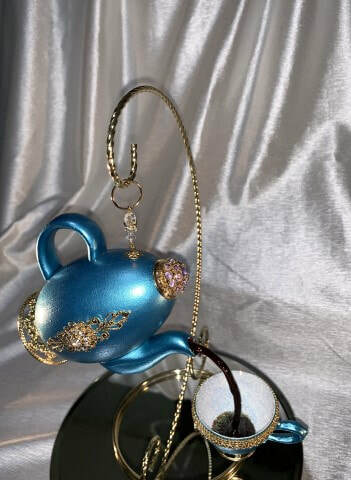 A goose egg designed into a hanging teapot with pouring tea into a decorated duck egg cup. 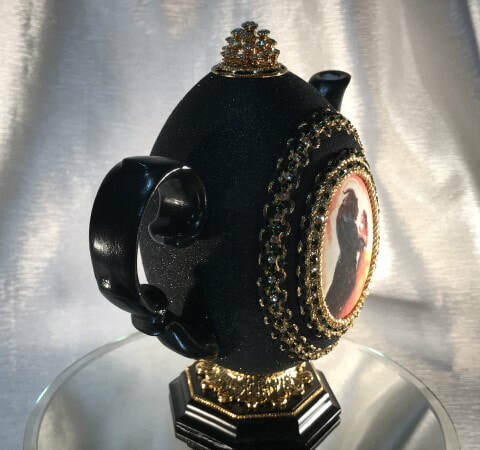 Decorated with Austrian gems and crystals around the teapot and finished with an crystal filigree as a topper. 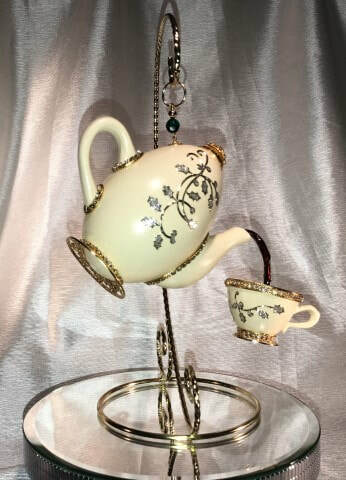 The tea is magically giving the illusion of pouring from the pot into the floating teacup. 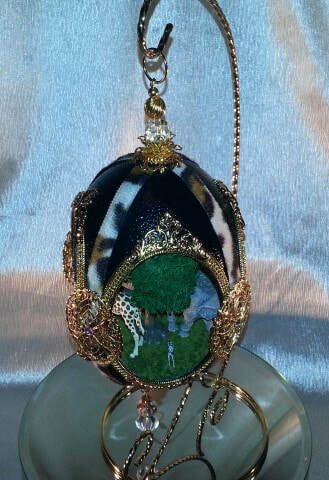 An Emu egg is cut on all four sides giving us a peak into the animals on the Serengeti plains. 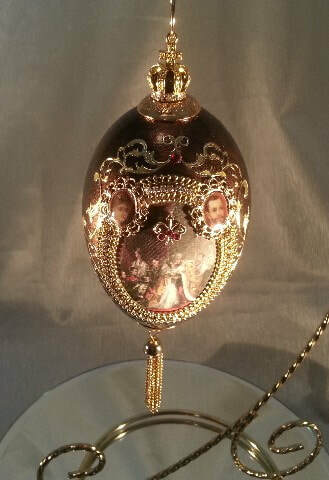 Austrian crystal and gold filigree accent this wonderful hanging ornament. 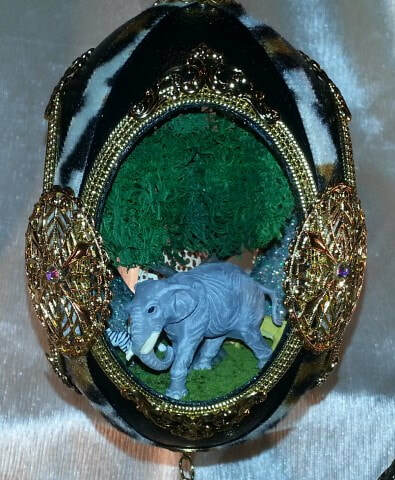 African print fabric and Gold filigree accent this design. 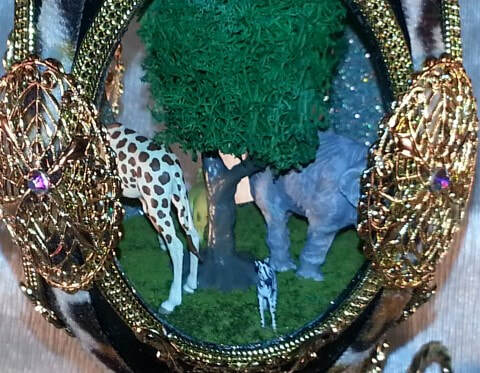 Hand painted German Preiser figurine animals are used to create this stunning African themed design. 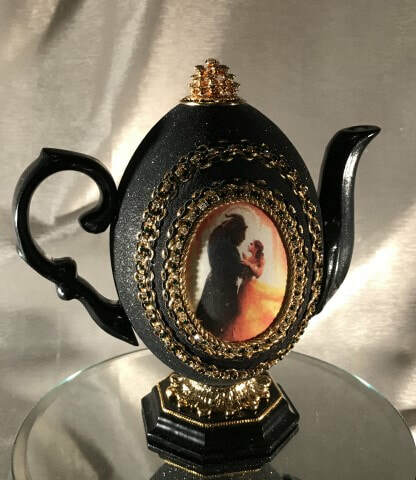 This tale as old as time is captured on a standing teapot. 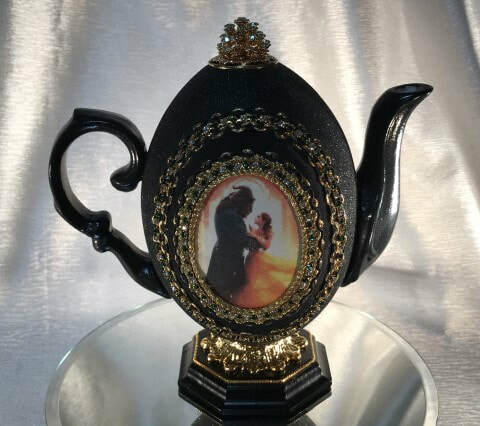 A Rhea egg is used to create this wonderful teapot design, a silk print captures belle and the beast dancing in the ballroom. 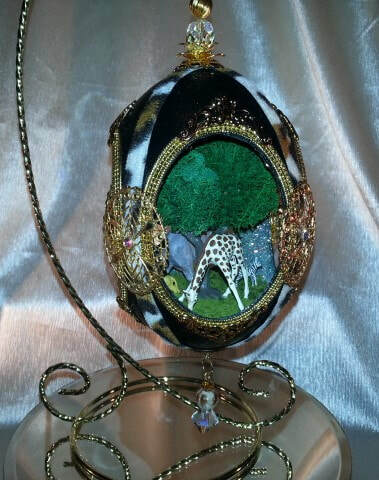 Austrian crystals and decorative braid enhance our silk print design. 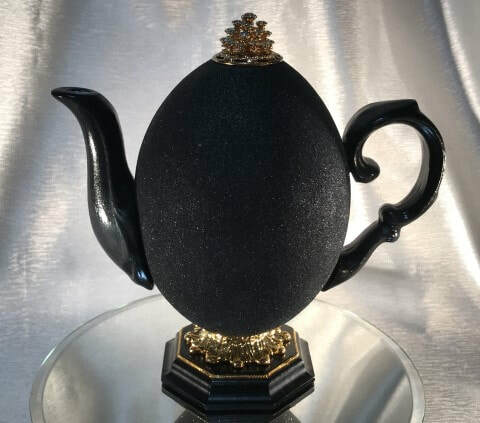 A four tier crystal finial tops our teapot and is supported by a gold plated stand and corian base.